You can see from the pictures that it's quite a simple toast. It's just your standard sourdough-olive oil-avocado blend. 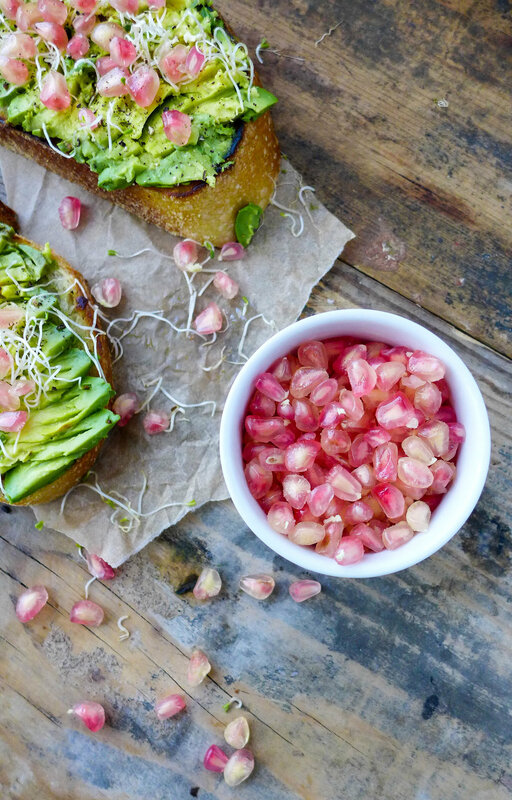 But when you add pomegranate seeds... it just takes the toast to a whole new level. The pom seeds are a crunchy, sweet addition. And you don't lose the savory aspect of the toast, like at all really. It's just a simple flavor game changer. You can find the recipe card below. Please try this one out if you haven't already. It's so yummy for breakfast, lunch, or snacking and literally takes about 30 seconds to throw together. Toast bread if desired. Spread with olive oil. Add avocado to your toast. Sprinkle with pomegranate seeds and salt & pepper.